Will this nefarious plan to transform Homo sapiens really work? We can't get enough of mad scientist cabals who want to take over the world with the power of genetic engineering. 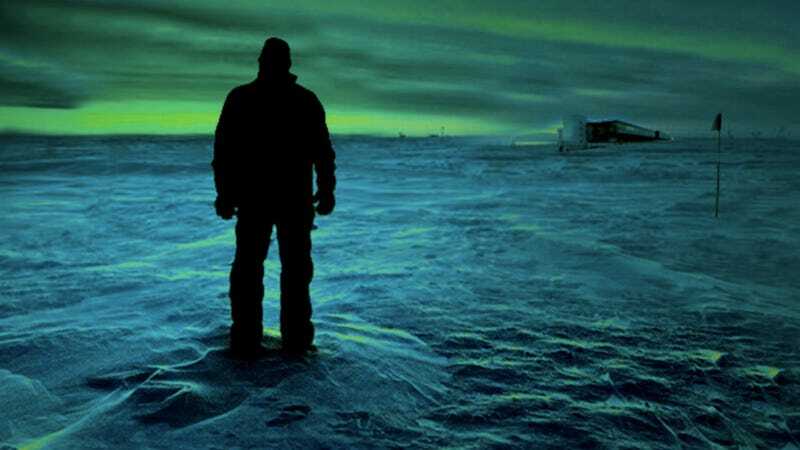 That's why we've brought you this exclusive excerpt from James Tabor's new science thriller Frozen Solid, which will be available in bookstores next Tuesday, March 26. A brilliant and dangerous cabal of scientists called Triage is determined to save the world from the perils of overpopulation by releasing a brutal virus that will change the planet forever. Arriving at the South Pole research station—more like an outpost on Mars than a terrestrial colony—the battle-tested heroine, CDC microbiologist Hallie Leland, confronts intrigue, conspiracy, and murder as Triage’s horrific plot unfolds in the deadliest place on earth. Eugenics is about altering a species’ characteristics. Size is perhaps the most basic characteristic of all. That’s the characteristic the Triagers want to change, and their virus is programmed to attack female reproductive systems . . .
Two hours later, they stood on a twelfth- floor hotel room balcony. The light was failing, and through the haze Dhaka shimmered like a city under foul water. A putrefying reek rose even this high. Clots of red taillights blocked every street and highway as far as they could see. “Behold the future,” Gerrin said. “London in fifty years, give or take,” Kendall said. He was a blocky man with a boxer’s face and an earl’s accent. His appearance, which included an ear like a handful of hamburger, came not from prizefighting but from four years of Oxford rugby. A geneticist, he was old and brilliant enough to have worked under Francis Crick and was, as well, the kind of Englishman who never made mention of that. “Paris, as well. France, for that matter,” Belleveau said. He had remained slim despite a childhood overly rich in every way. His skin was pale and, after kind, curious eyes, his best feature was lustrous curly black hair. Born to wealth, he had earned a medical degree from the Sorbonne and could have practiced obstetrics and gynecology in a gilt- edged seizième arrondissement offi ce suite. He worked in New Delhi instead, caring for any and all, payment accepted but never requested. Mostly he delivered babies and, as frequently these days, aborted them. He had come, as had Kendall, to meet with Gerrin one last time before Triage launched. After that, there would be no stopping it, and thus no reason to meet again. “But for Triage.” Gerrin raised his tumbler of Laphroaig, and they touched glasses. They drank, watched the darkness congeal, and no one spoke. Sometimes there was only waiting. Then Gerrin’s phone chimed. He answered, listened, hung up. From the room’s wall safe he retrieved a Globalstar satellite phone. He walked out onto the balcony, adjusted the long antenna, input a string of numbers, waited. Again he listened, very briefly this time, hung up without saying a word. “The replacement has arrived,” he told the other two. “No shame in that, Ian, given what we are about,” Gerrin said. “One wonders how many others were burned, doesn’t one?” Kendall asked. “Given druthers, some might’ve drawn and quartered poor old Darwin,” Kendall said. “Still,” Gerrin said, and the others smiled. “I, for one, am glad that capital punishment is no longer used,” Belleveau said. “Tell that to Saddam Hussein. And bin Laden,” Kendall said. “We are not like them.” Gerrin was their firebrand, Belleveau their heart, Kendall their diplomat. “Without Triage, this planet is doomed.” Gerrin turned to look directly at them. “I wonder if this is how the men who flew to Hiroshima felt? Just before it dropped?” Belleveau asked. “We are certain that the threat to Triage no longer exists?” Kendall asked. “Absolutely certain.” Gerrin did not smile often, but now he did to support his reassuring words. Triage had been long in the planning, and they had known one another for some years. From anyone else he would have found the question annoying, might have snapped off a retort, but he understood how this man’s spirit was tuned. No one spoke for a time. Belleveau looked up from his drink. Gerrin knew that, as a physician, he was concerned perhaps more than the others about such things. Necessary, unavoidable— these concepts he understood. But still . . . that oath. “Would it be accident or suicide?” Belleveau asked. “Too many accidents might draw undue attention, though, mightn’t they?” Kendall asked. “Yes, and because it is the world’s best containment laboratory,” Belleveau said. “A little after midnight.” Gerrin was sitting at the desk in the study of his modest home in the Virginia suburb called Vienna. He lived alone, had never married— had not avoided women, just the entanglements of matrimony. He was looking at Kendall and Belleveau’s video- call images. “There are complications.” Gerrin described the deaths of Lanahan, Montalban, and Bacon. Merritt had told him about Leland, as well, but he didn’t mention that part of their problem. “Is there reason to believe they were related to Triage?” Kendall asked. “It can’t be ruled out,” Gerrin said. “It was not easy fi nding a physician sympathetic to our cause and willing to spend a year at the South Pole,” Belleveau said. “Conjoining picornavirus and streptococcus was not child’s play, Jean-Claude,” Gerrin said. Kendall waved a hand dismissively. Like most Englishmen, he was slow to anger, but once aroused, his temper was fi erce. The glow was beginning. “Please, David. Joining bacteria and viruses is nothing new. Fischetti and Schuch discovered new symbiotic relationships between B. anthracis and viruses back in 2009. Even before that, Chisholm and Zeng at MIT fi gured out that viruses were manipulating genes in both Synechococcus and Prochlorococcus for their own benefit. Conjoining was not the challenge here. It was altering strep’s genetic sequencing to produce ovarian- cell affinity. If Blaine bollixed that and those bacteria are attacking other cell types . . .” He shook his head, unable to find a term of adequate gravity. “Blaine knows his work,” Gerrin said. “David, we are talking about three dead women.” Kendall sounded more disturbed with each sentence. “Four, actually,” Belleveau pointed out. “Killing was never part of our plan. Never.” Kendall’s face was red. “How many women has Morbell inoculated at this point?” Belleveau asked. “Yes.” Gerrin saw where Belleveau was going. Not a destination he wished for, but he could think of no good way to derail the conversation. “Yes,” Gerrin said, unable to keep the irritation out of his voice. “Eight percent of one and a half billion is one hundred and twenty million,” Belleveau said, with finality. “David,” Kendall said. “My God. I can’t even begin to imagine that.” There was an audible tremor in the older man’s voice. “But we goddamned bloody well have to assume it did, don’t we now?” Kendall shouted. “This was never part of what we were about." From the book FROZEN SOLID by James M. Tabor. Copyright © 2013 by James M. Tabor. Reprinted by arrangement with Ballantine Books, an imprint of The Random House Publishing Group, a division of Random House, Inc. All rights reserved.